“Coffee” is usually the first thought that I have upon waking. On this particular day I awoke, panicked, thinking “I need to get my wedding ring off my finger now”. I didn't know why but the band was cutting off circulation to my finger which had swollen to a light shade of grape. The ring itself looked like a hula hoop on a hippo. Butter, Vaseline, WD-40, there was no way I was squeezing out of it. I found a red bump at the knuckle. It itched so my assumption was I had been bitten. I treated it with “after bite”. I put my hand in ice. I kept it elevated. I tried Benedryl. Nothing was working. The finger was turning a deeper shade of purple and aching like a thumb hit by a hammer. By 10 pm it was time to go to the ER. In the ER the red bump had grown into a white-capped pustule and the doctor quickly identified what I should have guessed already. As I slept I was bitten by a single Red Imported Fire Ant (Solenopsis invicta). Fire Ants are native to South America but can be found throughout the southern U.S. Back in the 30’s they were inadvertently introduced by a cargo ship docked in Alabama. They are mound builders that can establish multiple satellite colonies of hundreds of thousands of ants. They inject painful venom to both defend the colony and take down potential prey. In Florida, these ants stand accused of causing the population decline of the Southern Hognose Snake (Heterodon simus) and the Florida Kingsnake (Lampropeltis getula floridanus) by consuming incubating eggs. A White-tailed Deer (Odocoileus virginianus) fawn will freeze in place at the sight, sound or smell of danger. If they happen to do so in or around a Fire Ant mound, the ants will begin climbing up the animal and then bite in unison. The bites are not only painful but the itching and swelling can last for four days or more. This of course happens to people as well. Some experience anaphylaxis. In the ER I was given a choice. Leave the wedding ring unscathed and hope the swelling subsides or cut the ring off to alleviate the pressure and save my finger. They did. The swelling subsided and wife insisted I get the ring fixed immediately. They say a bird in hand is worth two in the bush but sometimes a bird in hand is worth a bite to the face. My recent trip to Vermont had me reminiscing about an incident that occurred in nearly the exact spot where I saw last week’s Porcupine. 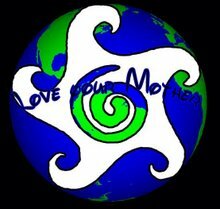 In the summer of 2005, as I made my way through the hilly roads up to Plymouth, I spotted what looked like a piece of litter in the road. As I drove closer I recognized it was a bird and it wasn’t going anywhere. I stopped, waved cars around it and carefully picked up a dazed and confused Evening Grosbeak (Coccothraustes vespertinu) that had no doubt been struck by a car. 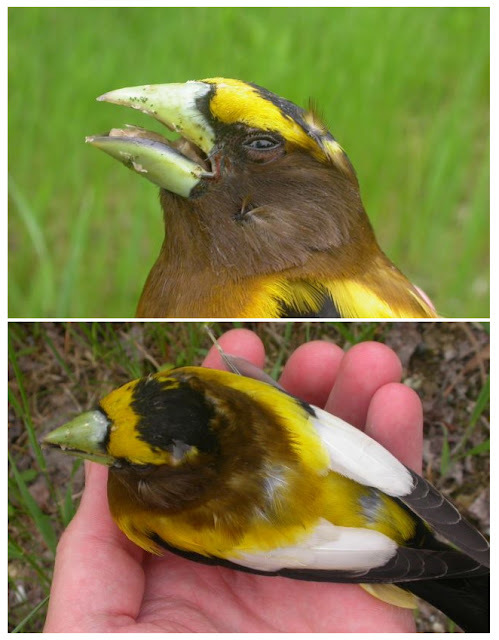 Evening Grosbeaks are members of the finch family and as the name might imply, especially to the French of which it derived, they have “large beaks”. Grosbeaks have the largest bill of the finches and feed on insects and seeds. The bill is strong enough to crack open the toughest of nuts. They also have been known to feed on roadside dirt and gravel to obtain minerals. Since roadside dirt is located near roads you can imagine the fate that often becomes of these birds. I just happened to be heading to a bird rehab center where I worked at the time. I scooped the frazzled flyer up, put it on the seat of my truck and put my hat over it, noting to myself that the towel I should always have for these instances was nowhere to be found. While driving down the road I heard a few peeps from under the hat and decided to check on the poor thing. I lifted up the hat and maybe it is post-traumatic stress but I distinctly remember seeing flames shooting from the bird’s eyes and foam coming from its mouth as it flew at me. It bit me on the face. Imagine the power needed to crack open the hardest seed, unleashed on the softest skin on your face! I grabbed the bird, which quickly let go of my face and bit my finger. In agony – I swerved to the side of the road, jumped out and desperately shook my hand trying to unleash this angry bird. It let go and flew off with vicious determination. It had escaped its horrible captor. No good deed goes unpunished and I had a V-shaped wound on my cheek to prove it. If you’ve ever seen a palm fly by at 60 MPH you were either in a hurricane or watching palms being transported on a flatbed truck. There are over 2500 palm species in the world and many have shallow root systems that allow them to bend in the wind but can be plucked from the ground and relocated by landscapers. A safer and more natural way to discover the beauty and diversity of palms is to take drive through any neighborhood in south Florida. Over twenty-five species are used as ornamentals but only ten are actually native. The Sabal Palm (Sabal palmetto) was voted Florida’s state tree in 1953 after what I can only imagine was a contentious and bitter dispute between the two state branches of congress. The House selected the regal Royal Palm (Roystonea regia) in 1949 but when the Senate passed on the idea, it wasn’t until four years later that the ubiquitous and iconic Sabal Palm with its fan-shaped fronds became the official state tree. Palms are unique in that they don’t have bark, cambium or heartwood like most trees. Instead they have an inner core protected by an outer sheath and both sections have living tissue. Most palms grow from a terminal bud out of the top of the tree with some exceptions that branch, including the Saw Palmetto (Serenoa repens). 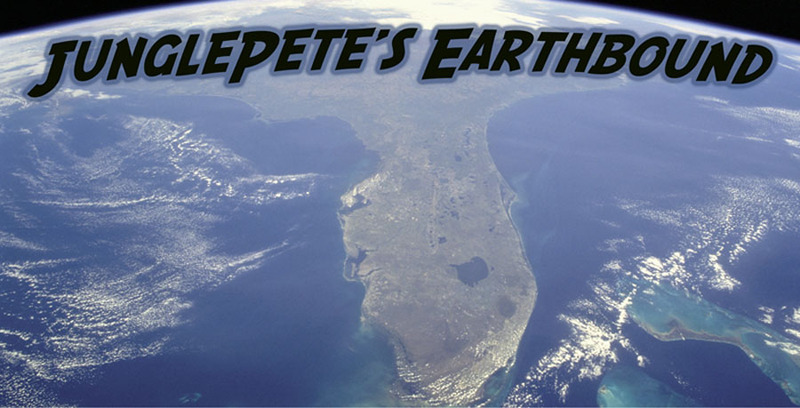 Growing up in Venice, FL my family would often camp along the Myakka River. 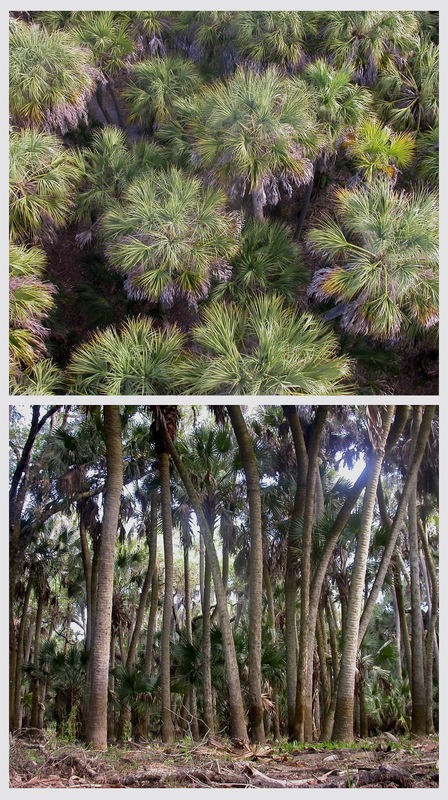 During nature walks, my dad would find a young Sabal Palm, aka Cabbage Palm. He would cut the new growth which resembled cabbage and my sisters and I would eat it, and - surprisingly enjoyed it. We call this treat Swamp Cabbage down here. You’ve probably eaten it too. They sell it in stores and serve it in restaurants with the entirely more delectable name of Heart-of-Palm. Sabal Palms are considered one of the hardiest palms and can be found throughout the southeastern United States. In south Florida they’re found in lawns, parking lots, oak forests, cypress swamps, coastal areas and occasionally in the middle of your living room after a hurricane. What makes a bird unique? Feathers. No one else has them. Beaks. Birds own it. Wings? They all have them too, as do bats and a variety of insects. But feet? Just about everyone in the animal kingdom has feet and yet birds feet come in an amazing array of shapes and styles. Each set says a great deal about a bird’s lifestyle. 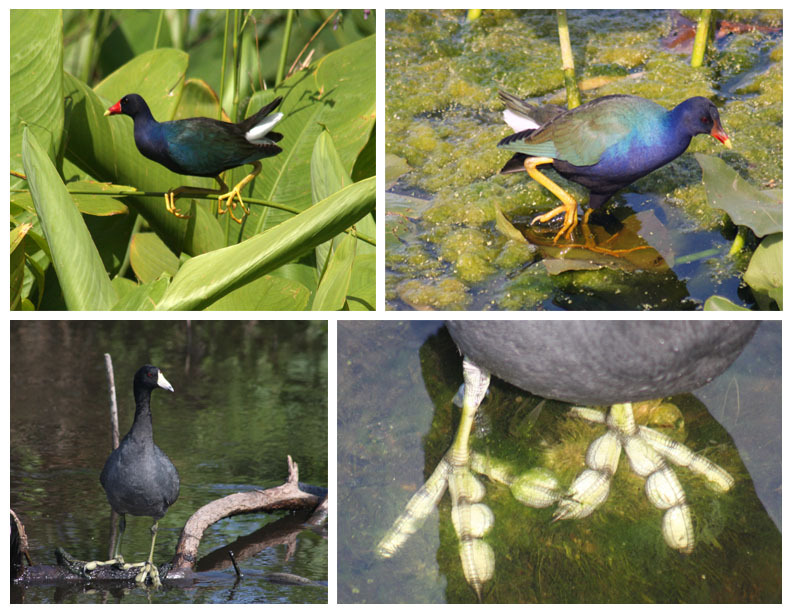 Purple Gallinules (Porphyrio martinica) and American Coots (Fulica Americana), both members of the Rallidae family, can be found in the same marshy habitat and yet have distinctly different feet. Rails in general are secretive birds that move through densely vegetated marshes to forage. Rails, moorhens and gallinules all have long slender toes which enable them to carefully step on, over and around, submerged, floating and swaying vegetation. Purple Gallinules are well-known for their gorgeous, iridescent emerald, turquoise and violet plumage. But they also have extremely long toes which they use to nimbly navigate the arched, tightrope-like leaves of Alligator Flag in search of seeds and insects. Flight seems to be a chore for these birds but if required they can propel themselves across the surface with heavy wing beats, as they tiptoe across the lily pads. American Coots on the other foot, have flat flanges that extended out from each toe. Although coots forage in the same marshy wetlands as gallinules, they also flock in open water. The flanged toes allow them to walk on floating vegetation as well as give them a flipper-like foot to paddle with or to dive up to six feet deep. Wings, beaks and feathers are impressive, but a bird’s feet can provide some amazing feats as well. Which bird’s feet impress you?